1843 (Jun. 3) London, England to New York, N.Y., folded Jun. 3rd General Post Office Notice with red London Crowned (6.3) datestamp and sent free as post office business, carried by Cunard Line Columbia from Liverpool Jun. 4th to Boston arriving Jun. 18th, red "Boston 'Ship' " cds and matching "20¾" rating h.s. 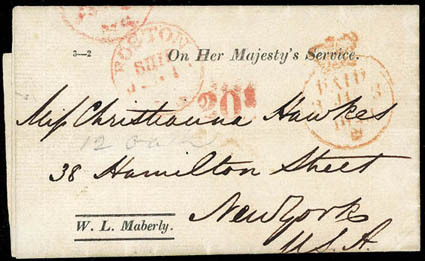 for 18¾¢ inland postage plus 2¢ ship fee, Very Fine, Carried on the Last Voyage of the Columbia. ex-Winter. This was the completed voyage of the "Columbia" before running aground near Seal Island, Nova Scotia on July 2nd 1843. General Post Office in London preprinted notice requesting 3 shilling 4 pence be paid before the letter would be sent from London. "12 Oak" in pencil marked by New York letter carrier. Addressee was music teacher who formerly resided at 38 Hamilton Street but moved to 12 Oak Street. A link back to Sale 75 - Lot 198, along with its description, will be appended to your message.